If you wanted a sucky job in 1898, you couldn’t do much worse than the Tsavo River project in Kenya. The work crew was assembled to build a railway bridge, but it quickly turned into a lion smorgasbord. Men were regularly dragged out of their tents at night and devoured. 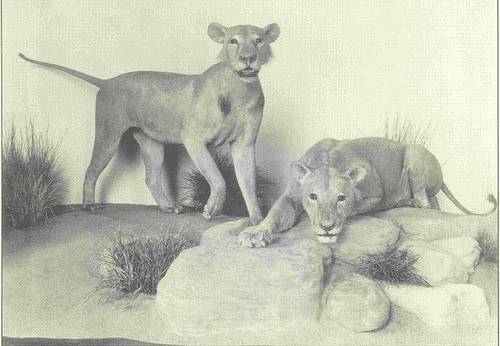 The predators evaded traps, ambushes and even thorn fences, but after 10 months engineer John Henry Patterson managed to kill these two enormous maneless lions. By that time they had killed nearly 140 men between them. And why? Apparently the flesh of railroad workers has a particular savor. The pair had got a taste for it in raiding shallow graves; when they ran out of graves they started going after live game.